The outline of today's Sunday school lesson in sharing time can be found here. With them out of sight I pulled out an apple and showed it to the rest of the kids. I invited them to look at it, to touch it, and to even smell it to make sure that it was in fact a real apple. I made sure that kids from all sides of the room got to make sure it was a real. I then sealed it and put it away, just out of sight and invited the child back into the room. The other children then told them what they saw. The kids all echoed that "there was a real apple." 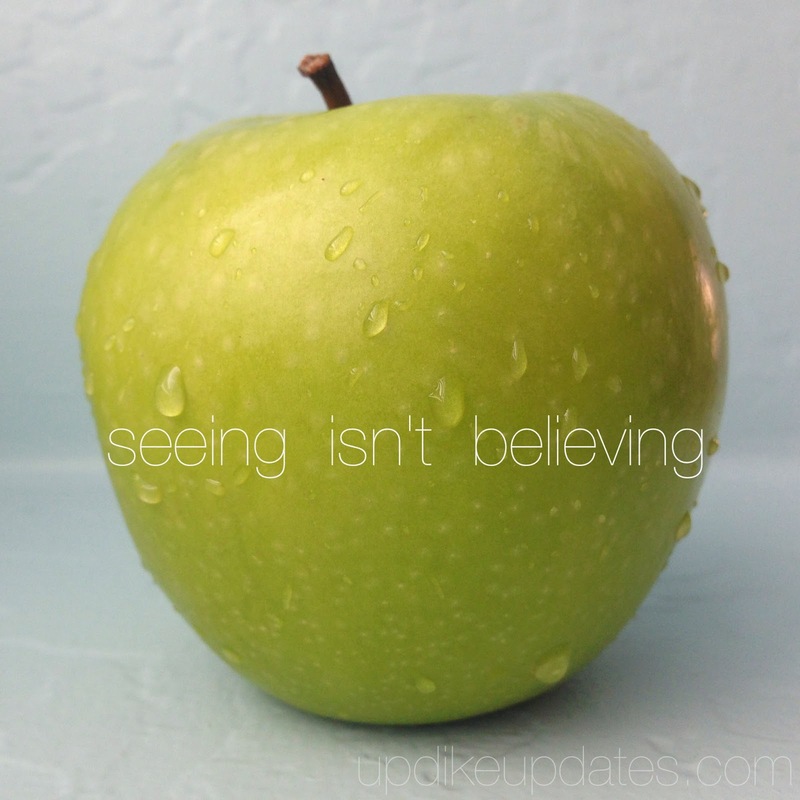 I played along and said "...but I don't see an apple, do you?" The child then looked around for the apple to no avail. I then asked those special witnesses from around the room who had touched it, to give them their word that there was in fact an apple, even though they didn't see it anymore. Luckily he believed them. I related this to our Savior Jesus Christ. 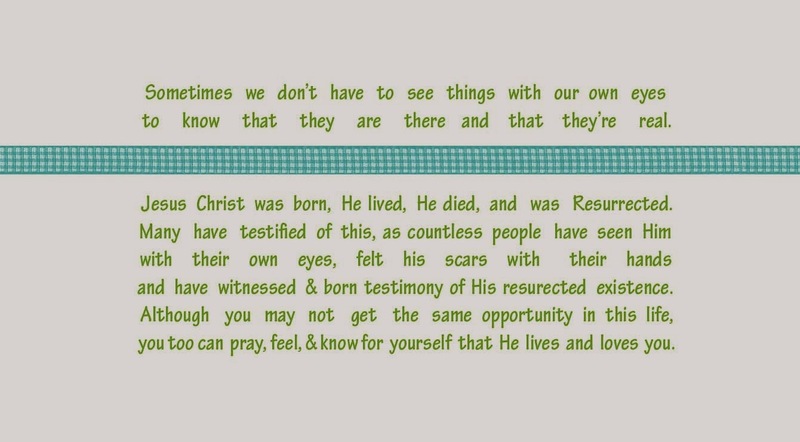 Though I personally have never seen him, I know that He lives. Our very measurement of time bears witness to His existence. News this week reported that more sea scrolls have been found... and what do you think they will say? Do you think they will tell about their authors' own lives? Probably not. They didn't have Facebook to blast everyone they knew with the exciting news, or a microphone to shout it out to a dissipating audience. They only knew of one way to ensure that their lasting words would not only be found by those who would be looking for it, but also that their words would withstand the test of time. Often people wouldn't write about themselves, but of something much bigger and more far-reaching. They would write their own testimonies of the miracles they witnessed, in hopes that the dry desert and their clay pots would help to preserve this message for generations to come. Jesus atoned for everyone, why then would he only have appeared to a select few around Jerusalem after his death? He didn't. We know that He appeared to the people of the American Continent at that time because they too felt inspired to preserve their written testimony of it as well, though instead of papyrus they wrote them on metal plates. It amazes me that even today with all the modern technology we have and scientific theories that try to disprove His existence... we are still discovering and uncovering others' promises that stand as their undeniable and dying word as though they are crying out from the dust that He lives! As outlined in the lesson I then had some adult brothers and sisters portray people who knew Jesus and got to see him after His death in His resurrected state. My friend Brandy spoke as though she was "Mary Magdalene" and summarize John 20:1-18 who was awestruck when she found Jesus' body was missing from the tomb only to turn around and see Him alive and well! Then Thomas who summarized John 20:19-29 and how he was gone when the rest of the apostles had seen Jesus Christ and that he didn't believe that Jesus could have been alive despite the other's testimony of His existence. Thomas earned his nickname by doubting Jesus' resurrection until just over a week later, when Jesus returned and Thomas saw Him in the flesh and literally felt His wounds in his hands, feet, and side. I then unsealed the apple from it's hiding place and gave it to the child who hadn't gotten to see the apple, so that like Thomas, he could have a physical manifestation thus dispelling all doubt. Another sweet friend read the account of those living on the other side of the Earth at that time. The civilization who called themselves the Nephites, witnessed the same Earthly manifestations of Christ's death, identical to those as depicted in the Bible, and their physical witness of His visit to them on the American Continent. I related that back to the apple and reminded them that physical witnesses of the apple weren't only on one side of the room but that people from all parts of the room got to experience it's validity for themselves. My husband Greg was a sweetie and spoke though he was the young 14 year old boy who couldn't understand why there were so many different religions when there was only one God. He then quoted James 1:5 "if any of you lack wisdom, let him ask of God, that giveth to all men liberally, and upbraideth not; and it shall be given him." He then told how the young boy felt prompted to pray about his quandary and upon doing so, after much toil and tribulation that the adversary wrought upon him, he saw a pillar of light exactly over his head, above the brightness of the sun, which descended gradually until in it he beheld two personages whose brightness "defy all description" and who called him by name. He physically saw our Heavenly Father and elder brother Jesus Christ. He heard His calm yet powerful voice say, "This is my beloved Son. Hear him!" Though taken back by the magnitude of this experience, Joseph Smith managed to formulate the question that had been the purpose of his supposition, and asked them which of all the churches was right. He was told that he shouldn't join any of them, as all the churches at that time had semblances of truth but had fallen away from His correct principles. Thus the restoration of Christ's true church began. keep them safe. I related this to those who have been given similar responsibility over them (ie. parents, prophets, and teachers), who they too can believe and trust. If people in Biblical times had a prophet to lead and guide them, would Heavenly Father leave us misguided in perilous times such as these? Of course not. I can say with assurity that I believe the words of our prophet and the inspired leaders of our church, as well as the infinite accounts of people throughout time who also bear witness of Christ's existence and resurrection. 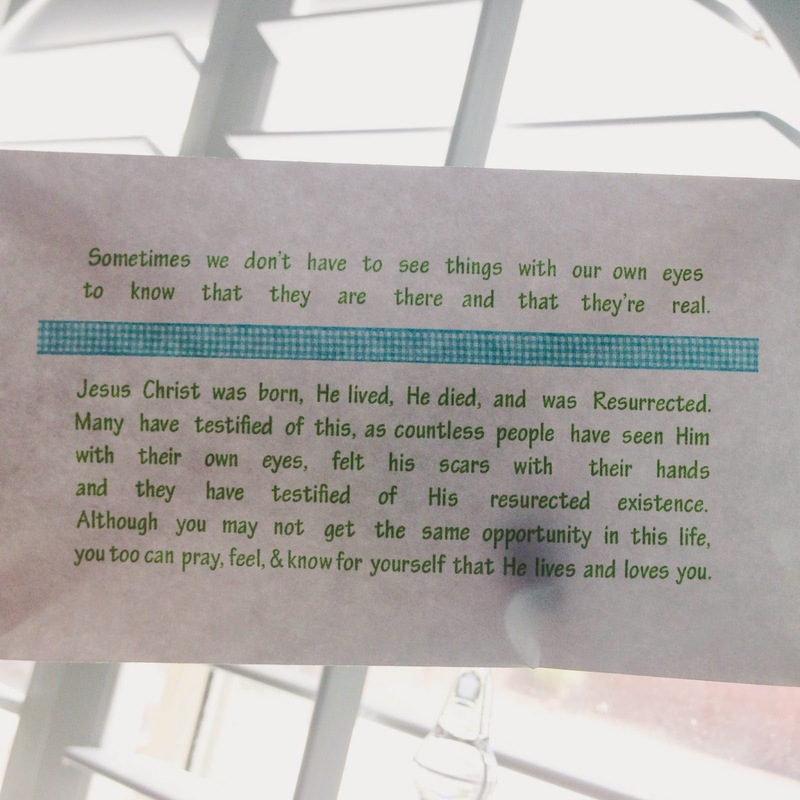 As handouts, I made each of them an envelope, placed a jellybean inside, printed the following words on them, and sealed them individually. I then said that although I can't see the jelly bean in its' entirety I can feel it, I can see the color of the jellybean when I hold it up to the light, how it has the ability to move it's surroundings (by shaping the paper that surrounds it), and I can even smell it's sweetness if I'm close enough to it. 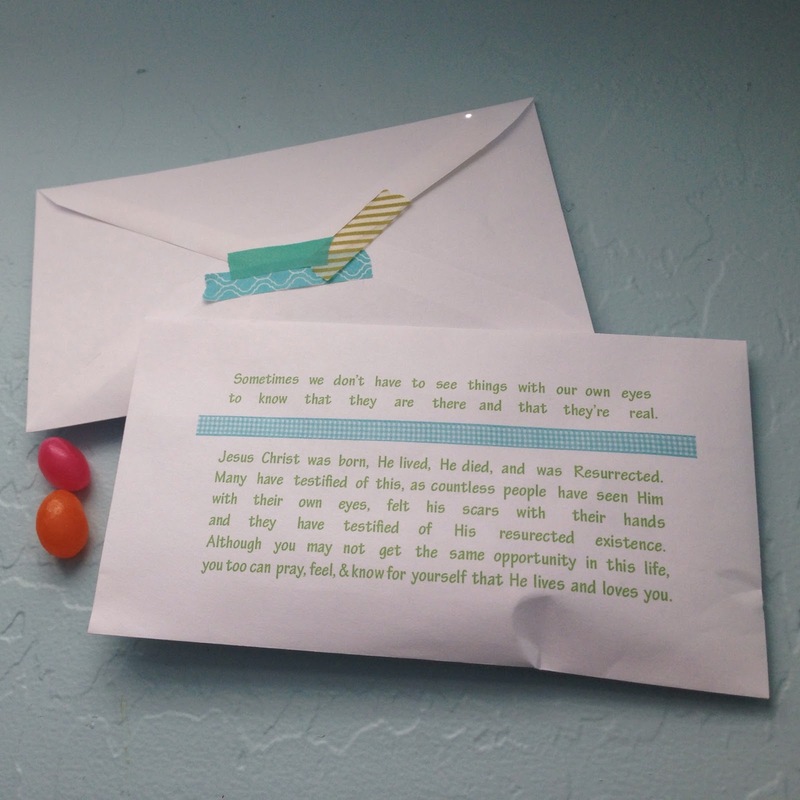 Although its' a childlike metaphore it is a very fundamental summary of my testimony of our Savior, Jesus Christ. There have been times that I've wished that my soul's memory, like the envelope, wasn't sealed, so that I might remember the preexistence and the loving faces of our Heavenly Father, Mother, and our elder brother Jesus Christ. 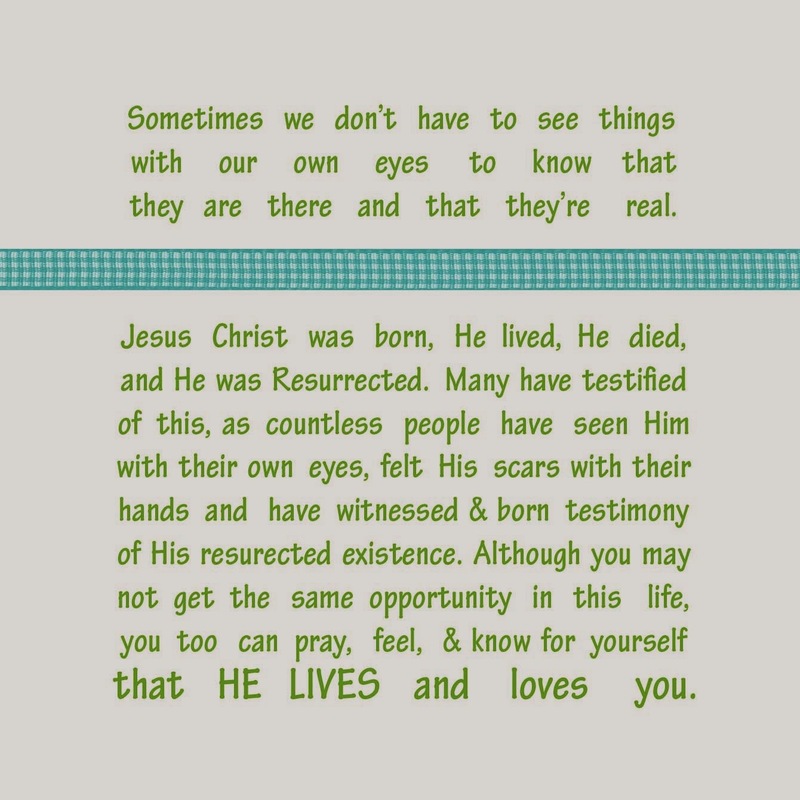 Though I don't need to see them or Him to believe that He lives. I have felt His sweet spirit. I can see His light through others and I can feel His spirit move me when I hear a testimony of Him given, a beautiful melody or even when I just take the time to notice the "little" miracles I pass by daily. Jesus Christ was born, He lived, He died, and was resurrected and it is in His name that I share this with gratitude and love. The following image is formatted to print on a standard business sized envelope.